Olga Pitsunova. Photo from personal Vkontakte account.Russia’s “foreign agents” law passed in 2012 has been a major hindrance for many NGOs by making their work illegal or cutting off their sources of funding. As a reminder, the law mandates that NGOs receiving financial support from abroad while engaging in “political activity” (a phrase clarified in 2015 to include virtually the entire spectrum of public work) must register as “foreign agents”. In 2014, the Russian Ministry of Justice was given, through an annex to the law, the right to enter NGOs on the register unilaterally. Since the law’s entry into force, NGOs and their heads have been fined tens of millions of roubles, dozens of NGOs have shut down because of unmanageable fines, while many NGO leaders have had to pay the fines out of their own pockets. 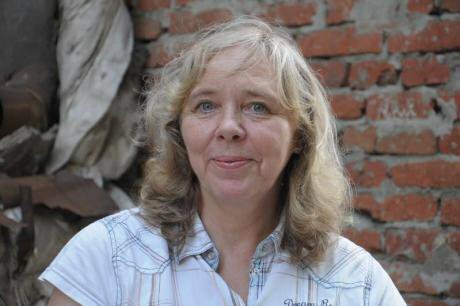 Olga Pitsunova, an ecological campaigner from the Volga town of Saratov, has been driven to the brink of survival. Pitsunova is a well-known green campaigner who has organised and taken part in dozens of ecological campaigns and events, playing an active role in the activities of the Social-Ecological Union. For many years, Pitsunova led the Partnership for Development association (PfD), which was known for its environmental and educational programmes. Recently, Pitsunova was involved in a civic campaign against plans to increase the generating capacity of the Balakov nuclear power plant and discharge of water from the power plant’s cooling pond directly into the Volga River, against the expansion of the temporary nuclear storage facility of the Saratov branch of RosRAO in the Tatishchevsk area and its conversion into a permanent repository. She fought against real estate development in the Kumysnaya polyana nature reserve in the city bounds and against efforts to cut down trees in Saratov. For many years, despite her outspoken views on environmental and anti-corruption issues, Olga Pitsunova and her organisation avoided conflicts with the authorities: PfD collaborated with Saratov regional Civic Chamber and sat on several public advisory boards for regional ministries. Moreover, in 2015 the Association received the National Ecological Prize. Olga’s first major run-in with the authorities took place in the summer of 2014 in connection with the “foreign agents” law. In early July, the Saratov region prosecutor’s office received an anonymous complaint demanding an “investigation into whether the Partnership for Development association is indeed funded by a foreign organisation and uses these funds for its social and political attacks against our authorities and the state, in which case why is it that no one has yet asked who it is that she works for”. In theory, an anonymous complaint can only trigger an inspection if it involves a major criminal act rather than, as in PfD’s case, an administrative infraction. 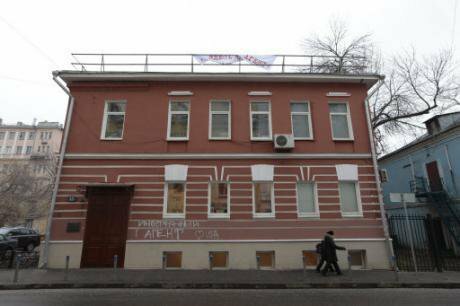 But in this case the Saratov prosecutors’ office was willing to make an exception. The situation developed rapidly. On 21 July 2014, the authorities ordered an expert review, which was completed the same day. On 22 July, acting district attorney Laptev concluded that there had been an administrative infraction and tried to force Pitsunova to acknowledge this in writing right in his office, where she came to file a motion to postpone the court hearing in order to familiarize herself with the charges. Indeed, the expert review — the document that kicked off proceedings against Olga Pitsunova — is worth examining in detail. To begin with, the choice of its author was far from random. Viktor Kupin is a professor in the department of theoretical and applied political sciences of the Saratov State Academy of Law. By background, Kupin is a political officer who “majored in military pedagogy in social sciences”, although on his page on the Saratov State Academy of Law website this speciality has transformed into “social philosophy”. Similarly, the website shortens the title of Kupin’s doctoral thesis (“The social foundations of strengthening the combat capabilities of the armed forces of the socialist national state”) — it sheds the “socialist national state” part. Kupin defended his thesis at the Lenin Military-Political Academy (with a concentration in the theory of scientific communism). The Moscow office of the Golos (‘Voice’) association. The NGO was declared a “foreign agent”, becoming the first NGO with this status in accordance with the new law. (c) Aleksandr Vilf / RIA Novosti. All rights reserved. “The de facto ecological activities of the Partnership for Development association and its head O.N. Pitsunova, which intentionally forms negative opinions in regards to ecological safety in the region’s energy sector, is directly linked to and threatens the geopolitical interests of Russia and the Eurasian Union. This interest in the Saratov oblast is driven by its special role and exception geopolitical location within Russia as a link within the developing Eurasian Union of Russia, Belarus, Kazakhstan. Weakening the above-named Union is one of the chief geopolitical aims of the US and its NATO partners”. How much does it cost to become an “agent”? On 4 August 2014, judge Sedova presided over a hearing where, having ignored an alternative expert review prepared by the ecologists, she sentenced the PfD to a fine of 300,000 roubles. In her decision, the judge relied on the results of a search undertaken by the police, which is not permitted for administrative cases. Professor Kupin’s expert review was the main document used to label the PfD a “foreign agent”, with much of its text included in the final court decision. PfD was found guilty of failing to register as a “foreign agent” on its own. Following its inclusion on the register of “foreign agents”, the association’s board of governance decided to disband. The PfD was finally dissolved in 2015 by the Ministry of Justice. If a foreign agent fails to label all of the materials it produces and distributes to the public at its events, in the media, or online, it is liable to be fined. (c) Ivan Sekretarev /AP/ Press Association Images. All rights reserved. The court hearing on the second fine was held on 28 January 2015, with the judge doubling the fine despite Olga’s financial troubles and the fact that the first fine had been paid on 13 January 2013. 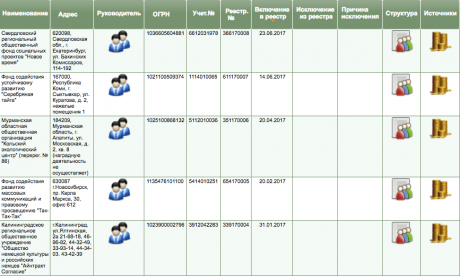 Attempts to find out the transfer account details for the second fine through the court and Sberbank went nowhere. Olga had to wait for enforcement proceedings again. The Bailiffs Service arrested Olga Pitsunova’s pension account and began to withhold 50% of all payments, including her disability pension. Even that was not enough for the Russian government, which decided to increase the financial pressure on Olga Pitsunova. The ecologists were unable to have the fines overturned. Moreover, paying them proved impossible as well. The bailiffs service is perfectly capable of finding information about all my accounts and sources of income, including their status and where the funds come from. They are also have every opportunity (not to mention duty) to familiarize themselves with Russian legislation. Despite this, the actions of the bailiffs of the Saratov regional branch of the Federal Service of Court Bailiffs violate my rights as a citizen of the Russian Federation, are degrading to me as a human being, pose a danger to my life and health, and are in gross violation of the federal law “On enforcement procedures” as well as the administrative and the civil procedure rules. I therefore believe that in this case we are dealing with a conscious and targeted campaign in violation of the law,” Olga wrote in her petition. The Bailiffs Service did not respond to the petition, but a week later returned the money and went back to withholding 50% of the income. Perhaps they were nudged by the racket kicked up by activists and publications in the press. The situation repeated itself in spring of 2017, when the bailiffs service again began to withhold 100% of the pension but reverted to their original plan of action following an outcry. So exactly a half of Olga Pitsunova’s pension payments goes to cover the enormous fine. It should be noted that the remaining amount is below the minimum subsistence level. Register of NGOs that carry out the functions of foreign agents. Source: Ministry of Justice of the Russian Federation. Obviously, aside from the emotional and physical harm suffered by Olga throughout this prolonged ordeal, we must take note of her exclusion from civil society. One could hardly expect her to continue with her social activism in the wake of such pressure and financial loss. Moreover, Pitsunova’s case had a knock-on effect on other NGOs in the region. “Because I have been forced to dial down my involvement in social causes (because of the courts and the need to deal with bailiffs as well as, unfortunately, health issues), the Social Ecological Council of the Saratov oblast (an independent grassroots organization created by heads of ecological NGOs) shut down, some ecological NGOs dissolved to avoid repeating our fate, others have become less active”, Olga Pitsunova told oDR in an interview. The ruinous fines levied on heads of NGOs that criticise the Russian authorities’ record on human rights, environmental protection, and so on are yet to become widespread in practice, but we are aware of at least ten such cases. Until now, Olga Pitsunova’s case has been the only one to go this far. This does not mean it will be the last.